Information and resources for supporters to campaign for the United Nations to live up to its legal and moral obligations to implement a human rights monitoring body in Western Sahara. Regular updates on the human rights situation in the Occupied Territories of Western Sahara. Charity supporting Saharawi culture. Site includes photos, music and background info. The Norwegian Support Committee's English language news service. Up to date and accessible. A vast resource of information. Also contains a good over-view of all the Western Sahara organisations worldwide. A network organisation with members in more than 30 countries, researching the foreign business interests in occupied Western Sahara. The campaign Fish Elsewhere! seeks to stop the controversial fisheries agreement that the EU has negotiated with Morocco. The agreement lets European vessels illegally fish the resources offshore occupied Western Sahara. 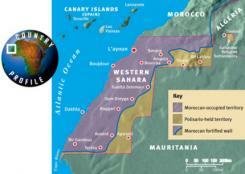 The campaign is carried out by Western Sahara groups in 21 EU states. Run from the occupied territories, the homepages of The Sahrawi Association of Victims of Grave Human Rights Violations Committed by the Moroccan State, is a very important source of information regarding the human rights violations committed in Western Sahara. Regularly updated. English and French/Spanish. The Polisario Front's e-mail based news service.